Information on the BBS, MBS and ABS Programs are sketched below, followed by the objectives of these programs. Thereafter the two board games are discussed. The BBS Program is a 4 week full time training intervention suited to those whose educational level is not very high at all and who just want to run a business to earn income for themselves and for their family units (Low level businesses are generally run, more in the survivalist category) The businesses are not likely to be registered, and are unlikely to grow too large. The information presented in this course is the basics, with no frills attached, and no unnecessary theory being given. Typically, the educational level for this program is primary school. The MBS Program is generally a 12 week, part-time program, but it could also be run as a 4-week full time program and is for those learners who are slightly better educated and who want to run a business that will grow and develop. We have found that whereas the majority of people we train on the MBS program run survivalist businesses, there are about 20% that will be interested in growing their business from the survivalist category into a micro business, then, hopefully, into a small business. The survivalist businesses are unlikely to be registered, but those that venture into the micro sector will be registered in time and will employ others. The base of theory is much more comprehensive than the BBS Program and not only covers the basics, but has necessary information about registering the business, tax, analysing the business and growing the business. The information contained in this programme is more comprehensive and is presented in greater depth than in the DBS Program, hence the students needs to have at least a mid-high school education. The ABS Program is a much longer program and contains more topics than the MBS program does. In addition the information presented is at a much greater depth. It takes 12 to 24 weeks to go through and is for those students that want mentoring and coaching whilst they are learning. Learners who complete this program will start up businesses in the micro sector and will grow from a micro to a small business and beyond. The goal of this programme is to have the learners start up businesses with the view to employ others and thus have a greater impact on society as a whole. This is a high-level program, so the learners will need to have at least completed their high school education, and is ideally suited to people who have graduated from a university, or who have a lot of work experience. Bridging programs also exists, if someone has done the BBS Program and wants to upgrade their knowledge to that of the MBS Program, or from an MBS Program to an ABS Program. 1) To train each learner to identify and research authentic business opportunities. 2) To have each learner research the business opportunities they have identified, following the business theory they are learning, in a dynamic, practical easily understood and interactive way. 3) To give each learner hands on experience of making money whilst learning business principles, thereby using the theory practically. 4) To have each learner demonstrate competence by starting up and successfully running a business in a sustainable, growth-producing manner. A successful business starts off with a business idea that is authentic, real that meets a need, or want, or solves a problem for people, or for another business. There is a huge difference between a business opportunity that is real and one that exists within one's imagination. We teach our learners to spot the difference. In addition to this, in most places in almost every country in which we have trained a DBSP program, we have found that most people start businesses by copying what another person is doing. It is of vital importance, therefore, that our learners are taught to identify different business opportunities on an ongoing basis. This is particularly important in the life cycle of the business because the emergence of competition will often play a factor in the sustainability of a business. If the learner does not know how to identify further business opportunities, then they stand a chance of falling victim to competition and going out of business. In addition to this it is vital that our learners understand the ingredients that go into determining whether a business opportunity is viable or not. 2. To have each learner research the business opportunities they have identified, following the business theory they are learning, in a dynamic, practical easily understood and interactive way. The DBSP's methodology has been carefully worked out so that there is a good interplay between the delivery of theory and practical application of this theory. As the course progresses, the learner is led along a path wherein he/she researches the opportunities they have identified by applying the theory directly to the business ideas that the learner is working on by way of conducting authentic research. The DBSP's intellectual property lies in the questions that have been sketched out relating to each theory topic that the learners follow in conducting their research. Towards the end of the training, the learner has gathered a body of knowledge on some business ideas that they have been working on and is in a position to evaluate these business ideas using the information that has been collected during the research sessions. The learner then selects the most viable business for him/her to start right after the course has completed, and converts the information and he/she has already collected into a business, via the business plan that the learner has written. 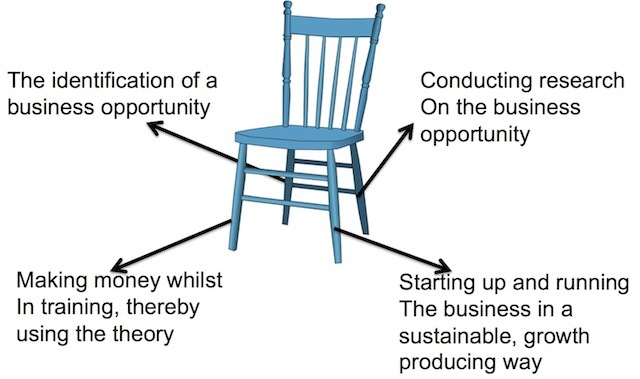 So, in essence, whilst learning the theory, the learner is conducting full research, leading up to him/her compiling his/her own business plan. This method has proven highly successful and leads to a high business success rate. # Through the moneymaking exercise, the theory can be put directly into practice , and learners see the relevance of the theory, because it impacts on the amount of money they make. # By making money whilst in training, the learner gains confidence in the fact that he/she can make money on their own, by selling a product or providing a service. # The learners grow in self-confidence and their self-esteem rises as they prove to themselves that they can make money. # The fact that the learners make consistent money, means that the learner can pay off course fees on a pay-as-you-go basis, thus reducing the dependency on donor funding. In order for a learner to achieve competence from the training program, there is only one task that he/she must perform and that is to start up and begin running a business in a sustainable, growth producing fashion. 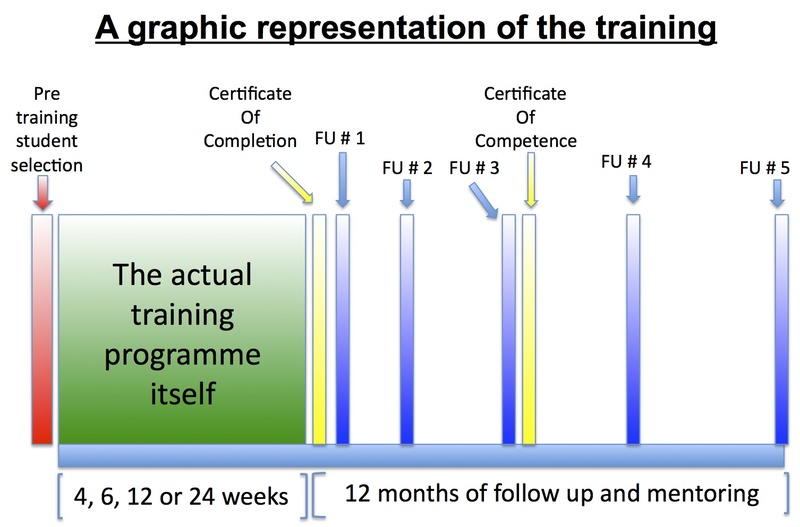 Once the learner has demonstrated this ability - generally measured at three to six months after they have completed the programme -, the learner receives his/her certificate of competence. * Identified a market niche (What business the learner can do that will make him/her money) in his/her own community. * Fully researched this business idea. * Calculated when the business will make a profit. * Developed a marketing and management strategy. * Drafted the essential records which need to be kept. * Compiled a business plan around this opportunity. * Started up their business. * Gained practical experience on how to manage their finances & to keep records. Each program is designed in accordance with the way adults learn. 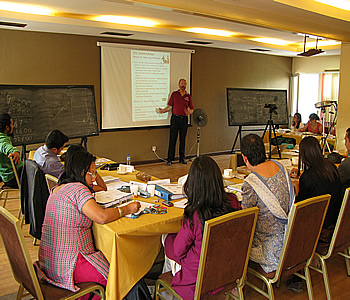 Program participants are carefully selected for their entrepreneurial inclination. To see how we select learners click here. Our tried and tested methodology consists of between 4 and 24 weeks of intensive training (depending on whether the training is run on a full-time basis, or on a part-time basis. In general the BBS program is a 4-week full-time training intervention, whilst the ABS program runs between 12 and 24 weeks as it is a part-time course). We use a unique combination of field and classroom work, wherein business concepts learned in the classroom are applied directly in the community in which the learner will run his/her business in a very practical way. The fieldwork includes learners researching actual business opportunities and ideas, following set questions in their manuals/workbooks and choosing the niche market strategy which best suits the his/her skills, interest and abilities. The learner is taught to analyze the profitability and sustainability of the new business and to draft the most suitable marketing and management strategy and ways of growing the new venture. The learner draws up their own business plan and record keeping systems based on their own research. Specially designed board games are used to supplement the training and are strategically placed in the training time line in order to maximize the learning from the interventions. As part of the methodology, each participant must have the equivalent of between R100 and R500, to be used to make more money with during the fieldwork exercises. This moneymaking aspect of the program is essential to put the theory directly into practice and to stimulate the learner's self esteem and confidence. The follow up section, crucial to ongoing student success, kicks in upon completion of all programmes and runs for a further 12 months. For more on the follow up and mentoring process Click here. The Financial Management Board Game has been designed to train the learners practically how to manage the finances, cash flow and working capital of their business. In addition to this, learners also gain experience in taking good financial decisions, working through financially-related problems and managing their stock levels. Emphasis is also put on the learners keeping a cash book on a transaction-by- transaction basis and to write up an income & expenditure statement. The running a business in an environment where HIV/AIDS is prevalent Board Game is designed to have the learners think, plan and strategise around how to run a business successfully if those around the business, or the business person him/herself, or one of their employees has HIV/AIDS. It works on the premise that HIV/AIDS will impact negatively upon a business if the business owner does not understand the context in which the business finds itself, fails to develop contingency plans and to educate his/herself and their staff about HIV/AIDS. It is a management tool, so the business owner can learn to manage the pandemic in their sphere of influence.